Hiroshi Sugimoto is one of the successful contemporary photographers; born in Japan, studied in Los Angeles and started living in New York. Sugimoto’s work focuses on life and death, the transience and the conflict between the two. He differs from his colleagues mainly by the conceptual and philosophical aspects of his photographs. His exploratory nature led him to an incredible series of photographs. He recalls the time when he decided to photograph movie theaters as a semi-hallucinatory conversation with his own self. Sugimoto photographed theaters. Here is an example of his work from the Regency Theater in San Francisco. At first glimpse, the photograph is simple. A blank, white screen, empty seats… The photograph is so simple that you may even think that there is no ingenuity in it. It is just a plain picture of a theater, a classical architectural documentary. The answer is simple. The answer is in how Sugimoto took these photographs. Sugimoto did not just take documentary pictures of theaters. He dressed up as a random tourist, walked into the theater as the movie started with everyone else. He sat down, set his camera on a tripod and pushed down on the shutter when the movie started. He exposed the film throughout the entire movie. And that is the reason why the screen is so bright. And that is the reason why he is so smartly genius. 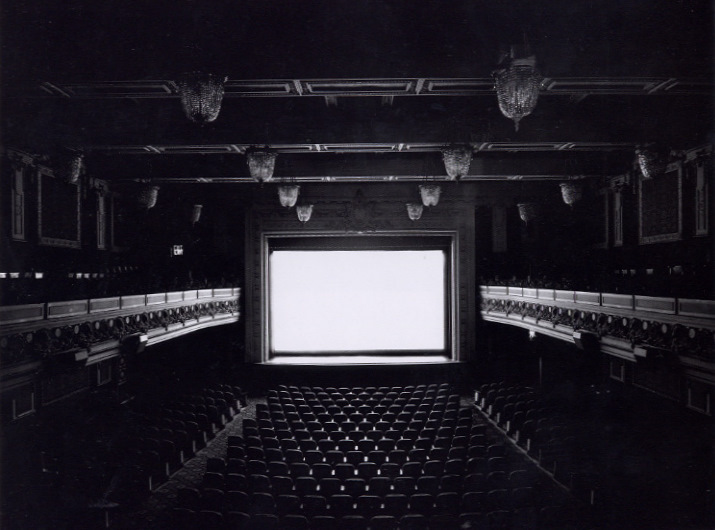 The way Sugimoto photographed these theaters shows his philosophically questioning side. The thinking behind these photographs, that they were taken with people in them, people that do not appear, yet keep being the main focus, are very modestly saying, fascinating. 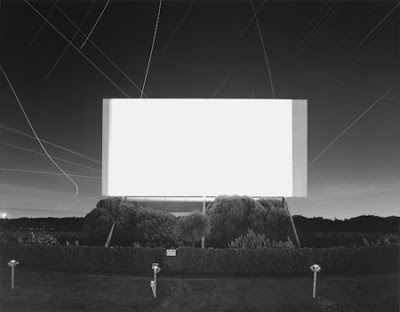 It rushes a million questions to my mind every time I see one of Sugimoto’s photographs from this series. How can a still architectural figure represent life when people that actually lived it pass through it and do not leave a single mark behind? It does and it makes me wonder what kind of lives have flown through these images. We can only imagine what those people have done or felt throughout the movie. Maybe there was a family with two little kids and the kids got bored of the movie. Or maybe there was a couple that argued in the middle of the movie and the woman left the theater leaving the man alone. Maybe there was a single guy, ditched by all of his friends and depressed, but still hanging on to life, enjoying his time. In the drive-thru cinema below, maybe there was an old car with a convertible top at the very back of the row in which a young lady had her very first kiss. Or maybe, there were no one. Maybe the entire movie was shown to an empty theater. Cédric and I love this photographer. It is fascinating to think that the very light which makes us the images can also blind us. 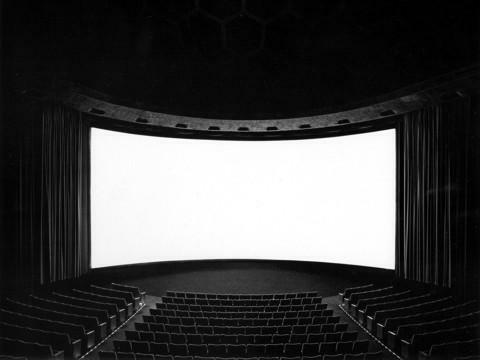 The spectator is hypnotized by the white screen as he is by the movies. and pictures are shot during an entire moive. then why isn't there any trace of audience?